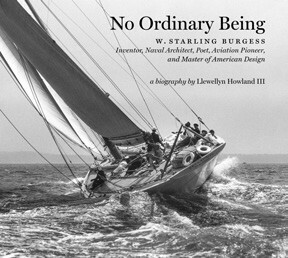 As a young schoolboy and avid sailor at Milton Academy in Milton, Massachusetts in the early 1950s, Llewellyn Howland III was drawn to one of his predecessors at the school, W. Starling Burgess, the designer of the grand J-Boat defenders of the America’s Cup: Enterprise, Rainbow, and Ranger; and the glorious staysail schooner Nina. The teenage Howland scoured the library for whatever he could find on Burgess and his boats. Little would he know that his fascination with the man would result in a 60-year quest that resulted in this fine biography that comprehensively chronicles the life and times of the famous naval architect and inventor. Born in 1878 to wealth and privilege, Burgess was orphaned at age 12. A precocious inventor who had received his first patent for a recoil-powered machine gun at age 19, he was also the first person to build and fly an airplane in New England, in 1910. * He did important work on the use of aluminum as a construction material in warships and pleasure boats, and he developed the Dymaxion automobile with Buckminster Fuller, a fellow designer who would go on to cultural fame in later decades. The book thoroughly traces Burgess’ evolution as a naval architect. Returning to yacht design in 1921 after his aircraft factory burned to the ground, he devised a novel rig for the sloop Vanitie that nearly beat Resolute in the America’s Cup trials. That was followed by three fishing schooners to compete against the Canadians for the International Fisherman’s Trophy, followed by his three Cup defenders, and many more until his death in 1947 of a heart attack. The subtitle names Burgess a “Master of American Design” and the variety of fields he worked in—at the highest levels—shows the overlap of genius. Parallel to his professional success, and occasional failure, was a personal life no less dramatic. A man of extreme charm and energy, Burgess was married five times, survived his first wife’s suicide, and was addicted to morphine most of his adult life. But at its heart this is a book about a naval architect, his brilliance, and his designs. Beyond the J-Boats, there is Manxman, the fishing schooner Columbia, the Atlantic class, power yachts, and a host of meter and letter sailboats too long to list. Howland, an author of yachting history and an antiquarian book dealer, aptly weaves his tale with the knowledge of an expert. Supported by the New Bedford Whaling Museum and Mystic Seaport, and presented by the maritime publisher David R. Godine, this is a deeply researched and lavishly illustrated book to pore over multiple times. Larry Kelly is the manager of the Maritime Bookstore at Mystic Seaport in Mystic, CT. No Ordinary Being is available at the bookstore or online at store.mysticseaport.org. * According to Jane’s All the World’s Aircraft, the definitive aviation reference book, the first person to build and fly an airplane in New England (or indeed the world) was Gustave Whitehead, a German immigrant who lived in Bridgeport, CT and made several powered flights from a hill in nearby Fairfield in 1901 – two years before the Wright brothers.